Box Text: 48 Chambers is a simple, yet challenging 2d game about movement and timing. Race against the clock for the high score as you collect orbs, dodge bullets and blades, and attempt to reach each chamber's exit in one piece. 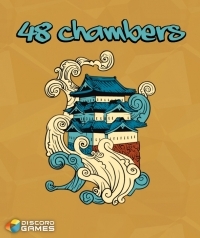 Defeat 48 increasingly difficult and treacherous levels to become the master of the 48 Chambers! This is a list of VGCollect users who have 48 Chambers in their Collection. This is a list of VGCollect users who have 48 Chambers in their Sell List. This is a list of VGCollect users who have 48 Chambers in their Wish List.